Play table with water wheel. 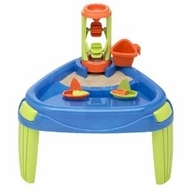 The removable 11 1/4" tall spinner tower works with sand or water. The sand pit transitions into a boat ramp leading to the water. Set has two sail boats and a pitcher. Measures 26" x 24 3/8" x 25 3/4". Easy snap together assembly. Measures 26" x 24 3/8" x 25 3/4"